We provide a solution that lets investors and projects form independent DAOs on the Ethereum blockchain. Each DAO becomes a part of the ecosystem that consists of investors, projects and third party services. Entrepreneurs are launching fundraising campaigns via the Daox Platform. Each campaign forms as an independent fundraising DAO on the Ethereum blockchain. Each DAO is managed by token-holders. Tokens are transferred in exchange for funds. Each fundraising DAO becomes a part of the global Daox Investment Ecosystem. The Daox Ecosystem is completely open and autonomous. It consists of investors, startups, DAOs and third-party services. Third-party software developers and service providers are integrating their services and tools for startups and investors, fueling the process of continuous improvement. Why Fundraising DAOs will Revolutionize Investing? DAOs play the role of advanced intermediaries between startups and its investors providing a leap forward in the efficiency of investing and raising funds. Here is a comparison of Fundraising DAOs vs other forms of investing. The Daox platform is a simple and user-friendly interface that allows for the interaction with the Daox ecosystem, including creation of DAOs. The platform is already operating. Here are some of the issues related to ICOs, crowdfunding, and investments sphere, that are solved by Daox today. 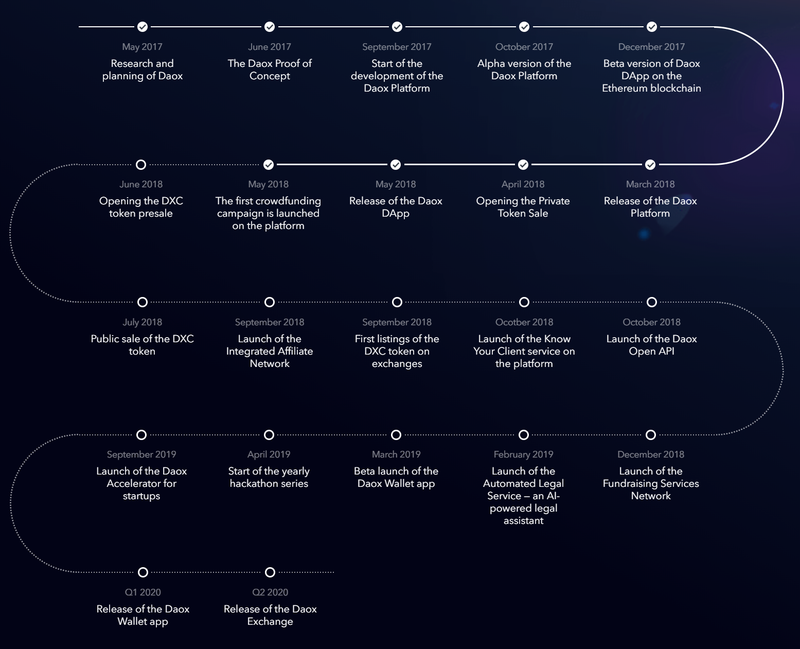 Each step of the development of the independent Daox ecosystem will enlarge this list, making Daox-based entities the smartest fundraising tool ever. Crowdfunding with cryptocurrencies requires special software or engagement of engineers. Project initiators has no incentive to keep their investors updated with their progress. Some startups might be spending raised funds on something other than the development of the project. When the startup team receive all the funds at once their motivation could drop dramatically. The number of projects that turn out to be scam is increasing in the ICO sphere. Average entrepreneurs are stuck choosing the right advertising services. Non-blockchain and non-tech startups very rarely raise funds using the ICO model. The lack of transparency opens up many ways of conducting fraudulent activity. For small-scale crowdfunding campaigns legal services cost too much. The process of attracting investments requires a lot of work that does no good for the product itself. Many crowdfunded startups fail to deliver the product, not providing return of the remaining funds. Services and tools being integrated in the Daox ecosystem are solving more issues and raising efficiency.